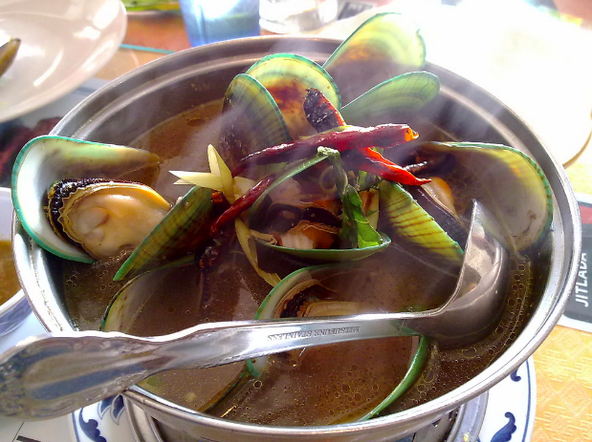 In 2007, Pulitzer Prize-winning food writer Jonathan Gold rediscovered Jitlada, proclaiming it “the spiciest Thai restaurant of the year.” Jitlada had been around for ages and was known as the first "nice" Thai restaurant in Hollywood. Just a year prior to Gold’s visit, the restaurant was bought by a family from Southern Thailand who revamped the menu to include their region’s classic dishes, some of the the hottest in all of Thai cooking. It’s no surprise Jonathan Gold was a regular patron. Mussels in green curry at Jitlada in Hollywood. Photo via TheDeliciousLife/CC.